The theme of LGBT History Month 2013 is Mathematicians, Scientists and Engineers. 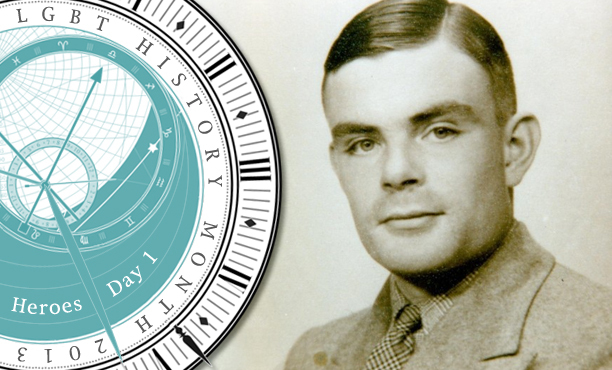 To start the Polari daily heroes series I have chosen the man who concluded our History Month Heroes feature in 2012, and whose centenary in 2012 inspired the theme: Alan Turing. Alan Turing was born on June 23, 1912. He was a mathematician, cryptanalyst and the father of computer science. His pioneering work in the 1930s led to the breaking of the Nazi’s Enigma codes in World War II. His idea for a universal machine – a machine that did not, like Enigma, need to be physically reconfigured to perform each new operation – led to the invention of the modern computer. In the post war years he worked on the building of the first digital computer, a project the government was invested in because of its potential use in developing an atomic bomb. The full extent of Turing’s work as a cryptanalyst, and on the development of both the computer and Artificial Intelligence, remained concealed until the 1980s. Like so many LGBT figures, his was a hidden history, in part because of the official secrecy surrounding his work in World War II, and in part because he was convicted of “gross indecency” – i.e. homosexual conduct – in 1952. Alan Turing died as a result of cyanide poisoning on June 7, 1954. There was an apple at the side of his bed. The coroner assumed that Turing had dipped the apple in cyanide before taking two bites out of it. A verdict of suicide was reached without question. On 12 June, 1954, Turing was cremated. He and his secret work were then lost to history for 30 years. What did Turing’s homosexuality have to do directly with his work? The answer is nothing and everything. Turing’s genius was in his way of looking at the world in a distinctive, and dissident, way. This is arguably because his sexuality put him at odds with that world. And so while his work was not a product of his homosexuality, it was a product of the thinking that his homosexuality enabled. A hero is, in many ways, the best of all that we can be, and Turing’s status as a hero to his country, and as a pioneer whose work made possible the virtual world through which I am now communicating, is unassailable. And like so many heroes before him, his death, whether it was suicide or murder, made him a martyr. There is an injustice in that, and it is a harsh reminder of where the extremes of prejudice and discrimination can lead. The tragedy of Turing’s short life after his arrest for homosexual conduct is shot through with a sense of helplessness, and the intolerable irony that he was destroyed by a system he worked so hard to shore up. Now he belongs to the ages. In honouring him we should remember that, and make his death count.